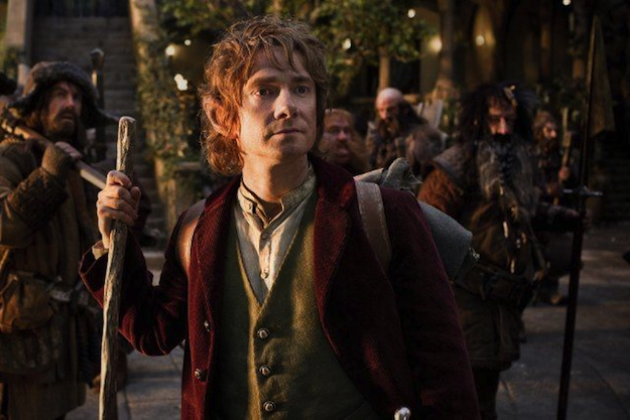 Right from the start, The Hobbit: An Unexpected Journey was destined to divide its audiences. Peter Jackson’s decisions to not only film at 48 frames-per-second — double the normal rate — but to also split J.R.R. Tolkien’s beloved novel into three full-length films were unabashedly controversial. As someone with fond recollections of reading The Hobbit in my youth, I met these announcements with large sighs and lowered expectations. Was it really necessary to stretch a 200-page novel into three epic films? Quite frankly, no, it wasn’t, but this move didn’t become the disaster it easily could have been. After a bit of an expendable prologue documenting the demolition of a dwarf kingdom by the immense dragon, Smaug, the story begins as expected. Bilbo Baggins (Ian Holm) is sitting alone on his eleventy-first birthday, writing out the details of his crazy un-hobbitlike adventure some 60 years prior. 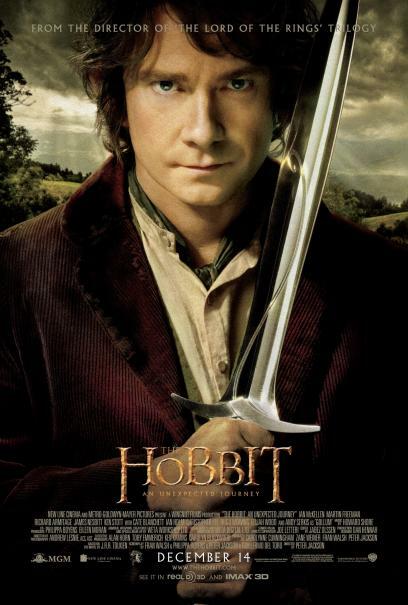 We are then sent to follow along on this “unexpected journey,” as young Bilbo (Martin Freeman) is granted with a surprise appearance by famed wizard Gandalf the Grey (Ian McKellen). 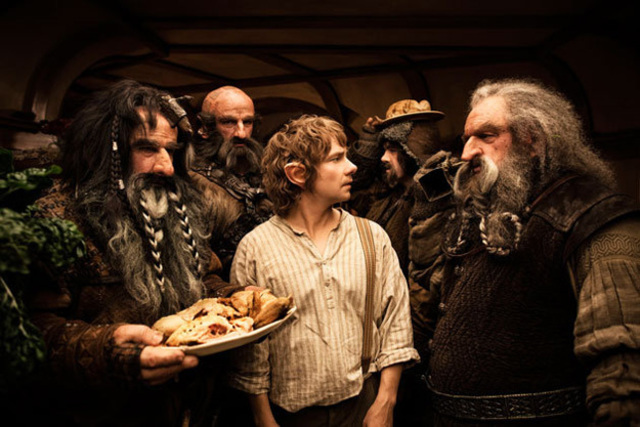 Soon thirteen dwarves, led by the proud Thorin Oakenshield (Richard Armitage), are at Bilbo’s door ready to embark on a quest to take back their homeland. Per Gandalf’s recommendation, they have sought out Bilbo to fulfill their need for a “burglar.” After much deliberation, Bilbo eventually concedes to leave his hobbit hole, and so the real story begins. Along the way, the crew runs into trolls, orcs, goblins and gigantic mountain creatures. There’s far more action than expected based on the source material, and one or two of the chase/battle scenes could have been omitted with little consequence. In fact, more content in general could have been removed entirely. As expected by stretching out a relatively short novel into three long films, Peter Jackson has dipped deeper into the Middle Earth lore, including a handful of characters seldom mentioned or not found at all in the book. Radagast the Brown (Sylvester McCoy) has a noteworthy role despite only being mentioned in passing in The Fellowship of the Ring. The Orc chieftain, Azog, also has an expanded role, predominantly to give the film its own central antagonist. This is not a faithful adaptation of the book by any means, which can be both a positive or negative depending on one’s viewpoint. Those wanting to see Tolkien’s words brought to life without any changes will be disappointed, but those who enjoy spending as much time in Middle Earth as possible will surely get a kick out of this. For me, I’m somewhere in the middle. Certainly a few scenes could have been excluded in order to make a more compact, arguably greater film, but damn if I didn’t get sucked into this fantasy world. This is a beautifully realized vision with well-designed characters and environments, and the special effects are amazing. The difference between the CGI used in The Hobbit and the Lord of the Rings trilogy is mind-boggling — this is especially notable during the film’s centerpiece, the much-loved riddle scene between Bilbo and Gollum. Although he looked great before, Gollum really comes to life here, with his wild-eyes and spastic movements. Once again, Andy Serkis delivers an incredible performance. Now, most people will know right away whether they want to see The Hobbit or not, but the big question here is: should I see it with the high frame rate? Yes, yes you should. I had little interest in this new gimmick, but was persuaded to indulge by some friends. I’m glad I did. Seeing the film in 3D at 48 frames-per-second (not to mention with the fantastic Dolby ATMOS sound system) was an experience unlike any other I have had in a theater, and it is absolutely worth checking out if only for the sheer novelty of it all. The general consensus has largely been a “love it or hate it” type deal, and I’m surprised that I fall in the former camp. It takes some time to get used to the quicker movements and video game-like visuals, but the high frame rate makes the 3D much more bearable. The Hobbit: An Unexpected Journey isn’t a perfect film, but I respect Peter Jackson for trying something new while undoubtedly pleasing countless fans begging for more Tolkien. Despite its excess length, I greatly enjoyed my time in the theater. Anyone even remotely curious in the film should seek it out, preferably with the higher frame rate. I also saw a HFR screening, just to try it out, I was surprised how similar it looked to TV. I agree P Jackson avoided the disaster it easily could have been. Was a great thrill ride. That huge battle near the end, with all those bridges, and with camera flying around, was remarkable filmmaking, especially witnessed on the big screen. I guess the movie has the same issue you mentioned in your Life of Pi review, that we know from the beginning the storyteller is alive. Nah, I wouldn’t say this film had the same issue as Life of Pi for me. With The Hobbit, it’s a well-known story, and it’s all about the characters, the fantasy world and the adventures along the way. With Life of Pi, it was just a teenager on a boat with a tiger, and it tried too hard to make it seem like the tiger was a threat. At least with The Hobbit there were other characters that could run into trouble as well, so even if we knew Bilbo would survive, there was always the chance that others might not. Did you enjoy the HFR? I can understand the TV comparisons — it certainly was a lot different than usual. It took some time for me to get used to it, but I started to really dig it by the end. Definitely a film to see on the big screen. The others character’s lives are in danger, that’s true enough. Glad to hear you enjoyed the HFR. Agreed that it worked well for this film, but it’s not something I would want to be the norm. Loved the three Lord of the Rings movies, so I’m looking forward to eventually seeing this one (Bluray/movie channel). I’ve never read The Hobbit (or The Lord of the Rings for that matter), so that it doesn’t follow it exactly and expands a lot of stuff won’t be an issue for me. I tend to like stuff like this (and comic book movies) more when I’m not familiar with the source material. Thanks man. I think it’s to your advantage that you aren’t familiar with the source material. It will make certain differences much easier to overlook, and you can just go along for the ride. If you get a chance, I highly recommend trying out the HFR in the theater. It’s something everyone should experience at least once. I’m kinda curious about the new technique and double frames but I don’t think it’s enough to get me to see it in the cinema. I’ll probably wait for DVD, I enjoyed the book but I think two movies based on that would be enough. Yeah, I wasn’t too thrilled that this was going to be two movies, but three is just ridiculous. Still a fun film though. If you’re able, you should check out the HFR — it’s a really unique experience. I quite enjoyed it, but it could have been a bit shorter. Will be rewatching it again in January. Yeah, agreed on the length. I don’t know if I will be watching it again anytime soon, but I enjoyed it quite a bit this time. Glad you dug the 48fps, man! I was raving about it after I saw it and in my review, and then as I travelled about the blogosphere I felt like I couldnt find ANYONE else who liked it! I’ve run across a few people here and there now, but… I still think we’re in the minority. I’m a fan of the 48FPS as well Fogs! Thanks dude. Yeah, it’s pretty amazing to hear the difference in opinion about the HFR. Some people have been just crazy about it, walking out and demanding their money back and whatnot. But ultimately it’s something new, and therefore people are going to freak out because it’s not what they’re used to. Good review Eric. I found the movie quite entertaining although this is not exactly my genre. I wish there could be more real conversations, and more characters I could remember distinctly from the movie. I liked it all the same. Yeah, the characters could have been fleshed out a bit more, but that’s bound to happen with 13 dwarfs. Glad you dug it, Dan. Peter Jackson’s imagination and direction to bring Middle Earth to life is just incredible, and yet there is so much heart that can be found in the movie. (I feel like watching it a second time!) You’re right – the riddle scene was enthralling and Gollum was just amazing. Thank you for the review which helped to give some ground to the experience I had watching it! Glad to help out, and happy to hear that you enjoyed the film so much! You can just tell that Peter Jackson loves the world Tolkien created, and he has done a great job realizing this with every film so far. Looking forward to part two! Hi Eric, I’m back! 🙂 Y’know, I never read the books and I really enjoyed LOTR so I don’t really mind the trilogy thing, esp. at the helm of PJ again. I think since I love the world that Tolkien created and PJ brought it to life so wonderfully, I had a great time watching it. I just saw it a second time earlier today and I can’t wait for part 2!! Hey Ruth, welcome back! Hope you had an awesome vacation. Wow, so you have already seen The Hobbit twice?? Glad to hear you are enjoying it so much — I think it really does help to have not read the book, in this instance. Definitely with you in being “in the middle” as to the enjoyment factor. It’s a good, solid fantasy film. But some of the embellishments for, I guess, mass cinema going audiences, were a bit much at times. Still, looking forward to the next two. Yeah, it felt like sometimes the film didn’t know if it wanted to be serious LOTR-type fantasy or more geared toward children. A better balance would have been preferable, but I still enjoyed the film quite a bit. Agreed on looking forward to the next two. One of my pet peeves as a film fan is when a director stretches out a movie without much of a reason. I was one that actually found the LOTR trilogy overly long, deeming entire sequences wholly unnecessary. This is a recurrent problem for Peter Jackson, who I think has received a license by studio executives to overextend himself due to the success of the famed franchise. Look for example at his take on King Kong which ran for 187 min or the dull The Lovely Bones at 135 min, both films could have easily lost 30 min without losing anything in terms of cohesion or depth. I haven’t seen The Hobbit, but I definitely approach it with a lot of hesitation. Hi Niels, that’s a great point about Jackson. It does seem like he’s given free reign over his films, which often leads to them being far more bloated than necessary. The Lovely Bones, the shortest of the group, was so bad that it actually felt the longest. If you had reservations about LOTR, I’m not sure The Hobbit will be your cup of tea either. There really was no need to stretch this relatively short novel into three massive films.